Main Entrance Doors and Windows are the first point of your home so it needs a great attention to be designed as per Vaastu Shastra. Here we are with some Vastu guidelines that one should always consider before designing and placing the Main entrance doors and windows. 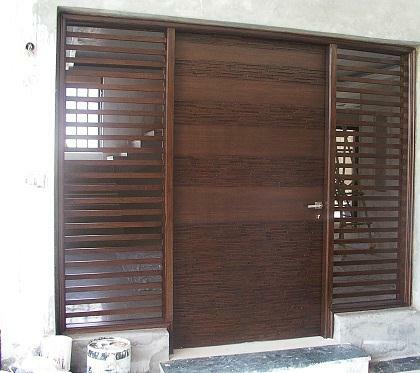 While designing Main entrance door and windows one should take care of some important aspects like placement and location of the main door, color and size of the main entrance door and windows and so on. When anyone visit to your home he or she enters the home through the main door so it should produce positive energy each time a person walks in. Read the mentioned Vastu guidelines which can help you position your main entrance door as per Vastu Shastra. Direction of the main entrance door is the most important factor to decide. To figure out the right Direction of the Main Entrance Door divide the front facade of the house into nine parts. Place the door in a way that it should be in the fourth section from the right hand side or the sixth from the left side, when facing the house. You can decide any of the below mentioned direction for main entrance door. South facing main door should not be located in the center of the building . North facing door should be in the center of the wall favoring toward the West side, that is towards the North-West. West facing door should be located South of center and not North of center, that is towards the South-West. East facing door can be located in the centre of the East wall, but a little more to the North-East. There should not be a balcony or verandah in front of the door if you have entrance of the house in the south direction. It is not advised to have the main entrance on the south side. Main door should not be located exactly in the centre of the house or in the extreme corner. The entrance doors of two houses should not be exactly opposing one another. Do not construct any underground tank, septic tank under the main entrance. There should be no wall exactly in the front of main door when one enters the house. There should be a door that opens to the next room. if you have two entrance door than they should not be placed exactly opposite to each other. -	The main entrance door should be the largest door of the house. -	The main door should have two shutters and open to the inside of the building. -	A shadow should not fall on the main door. -	The main door of the house should not be below ground. -	Main entrance door should have thresholds. -	Do not place the shoes in front of the door, but to the side. -	Do not design slanted, sliding, or circular doors. -	Avoid self closing and creaking doors.